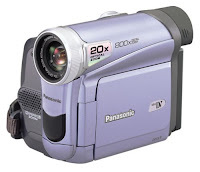 So I had bought a Panasonic PV-GS9 Mini-DV camcorder a few years back. Unfortunately, it has stopped working. Now during playback it displays horizontal blue bars. I read several threads that recommended buying a Mini DV cleaner and running it up to 4 times. They also suggested to change to change your video tape as it may have been the cause of the original problem. These solutions may have worked for many but not me. My camera was becoming progressively worse. It went to blue bars and no sound to no picture at all...just blue. After using a cleaner 4 times I became frustrated to the point I was going to buy a new camera. However, with the camera still playing, I did the typical guy thing and rolled up my fist and gave it a good hit along side of it. Remarkably it went back to just the blue bars. I hit it again and it went back to a perfect picture. Seriously, it really did work! As an added bonus I felt like I was the Fonz! I'm not saying this will work for you and hitting it too hard could make things worse but I was at a point where I didn't care any more and took a chance. I have since found out that this trick has worked for at least a dozen others as well. If it works for you let others know by posting here. I love it! The hard hit to the front saved the day! I cannot believe this. I just went into panic mode when I saw the blue lines in several tapes of our oldest girl. Irreplaceable memories from when she was 1 to 2 1/2 years old. I wacked my Panasonic mini-DV camera on the tape side while playing the tape. The picture got better with eachwhack, then the camera completely stopped. I ejected the tape, put it back in and it played perfectly. I immediately capture it to Windows Movie Maker in Windows 7. What a sigh of relief. 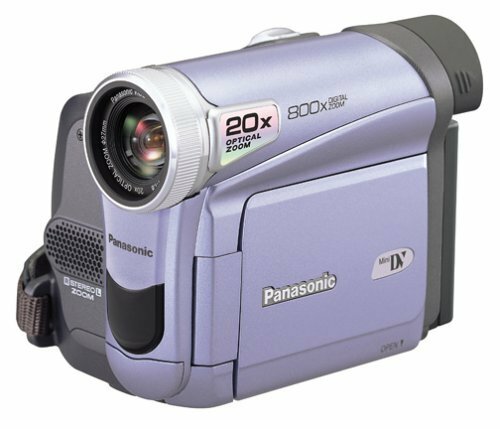 I need to capture all my tapes now because I can't trust this camera anymore, but I still can't believe that the physical abuse of the camera made it work. No BS. Was searching ebay so I could transfer my tapes to PC!! My observation: I think the issue might be to do with the tape reading head. While recording the camcorder suddenly rotated forward while mounted on the tripod, which might have caused the reading head to mis-align and produce gray bars. That could be why when I shake camera front and back, the head might have got adjusted to correct position and worked. Again, this is just my theory based on the events. I could be wrong. THanks, this has help me work wonders! SO glad I came across this. Pushed play in video playback mode, gave it a tap on the nose and, presto! Like new. Thanks!! Probably the best and most inexpensive solution to an issue I ever recieved on a post an the net!! Your a rock star Frank!! Wanted to add my thanks to everyone else's. Awesome low tech fix. Gracias! This is awesome...thanks for posting this thread. I had the same blue lines problem. Gave it a few good whacks on the tape side. It took a few minutes of playing a tape before the lines disappeared but it worked! Thanks again! Three Cheers for the internet and the help with this problem.It took a few whack but its back.Thank you for this post. Omg!!! I spent a day searching for possible solutions with no luck. And right before giving up, I found this blog. I said what the heck, I'll try this too. And voila, it worked!!!!!! Ok, looks good, but might just be coincidence or option of last resort. I frequently get the dreaded horizontal lines on MiniDV playback (sony) but full forward wind, rewind, and it clears every time. Maybe it's humidity or some digital signal thing working its way out? Dude, this totally cleared up my blue horizontal lines! Unbelievable! Thanks so much!! !